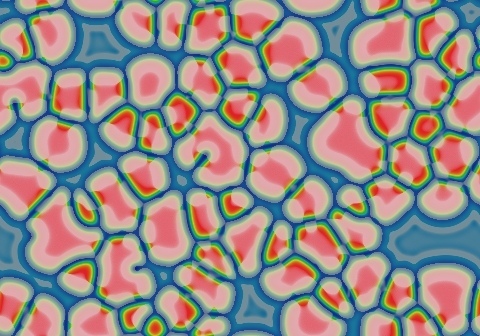 These images and movie demonstrate the behavior of the Gray-Scott reaction-diffusion system with σ=Du/Dv=2 and parameters F=0.0980, k=0.0570. The blue state is stable, but any red state grows to overpower it. Here, red spots grow into "bubbles". Smaller bubbles shrink and vertices gradually coalesce, maintaining angles as close to 120o as possible. (Compare to the phenomenon seen immediately to the west). This pattern takes over 2,300,000 tu to turn into a single hexagonal bubble.